Have you ever run across those large windows high up on office buildings, that just take forever to clean? Well, the Alumax large window squeegee is the answer to all your problems. The rubber squeegee and aluminum channel will clean a 36" swath per pass. The nylon handle swivels and can be attached to any extending pole. Once you find the proper placement for the channel within the handle, 2 screws will need to be tightened to hold it in place. There is no system that is easier to use, or cleans more efficiently on the market. The Alumax name provides unsurpassed quality! This Alumax large window squeegee system typically cuts cleaning times by 1/3 because of the efficiency it creates in cleaning windows. Those large areas are done in less time, making each job more profitable. 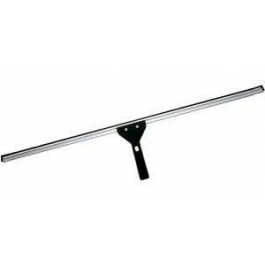 This model does twice the work of our other large stainless steel professional window squeegee. Both of those squeegees, plus other sized pieces can be found in our window washing squeegees department. Customers who were interested in the Alumax Large Window Squeegee were also interested in the following items. This is a review for the Alumax Large Window Squeegee.